But if you try sometime…you just might find…ya get what ya need! I had visions of getting to dive again, something I haven’t done since 2005, and with the best instructor to boot! 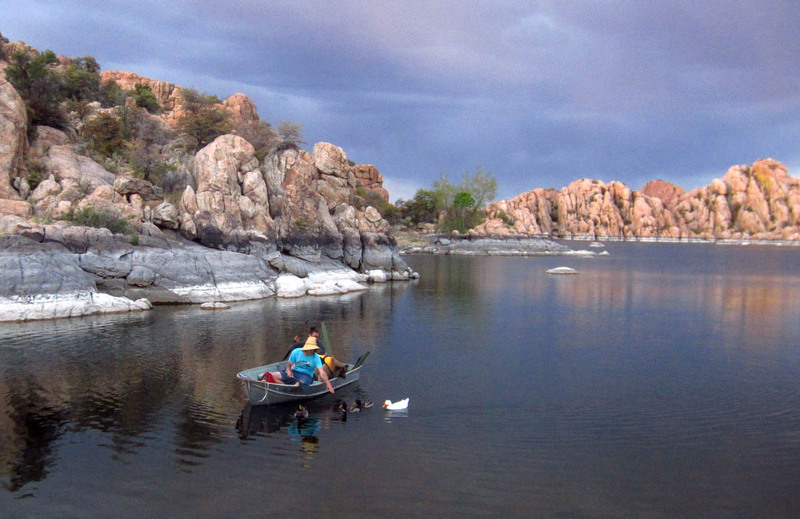 I had been watching the Lake Havasu City temperatures creep up, up, up while I was in Tucson. The predicted highs were now approaching triple digits. The nature of my work situation is that once I am in a certain place come Monday morning, it is tough for me to move long distances again until Friday. So I knew I would be looking at a minimum of a five day commitment. I kept telling myself, “You’ll have air conditioning, you can do it!” But I don’t think it’s fair to ask a 1994 car, my little Tracker Toad, to bear the extra burden of air conditioning at his age. I had a long list of errands to run while I was in Phoenix, including the two hour Taliesin West tour, a stop at REI for new bike tires, a Whole Foods run, and the UPS store. By the end of the day in Phoenix heat and traffic, the Tracker and I were both so drained that I knew I had to find another plan. If I couldn’t take the piercing hot sun and low 90’s in Phoenix, I sure couldn’t sit inside a box all day in 98 degree temps. 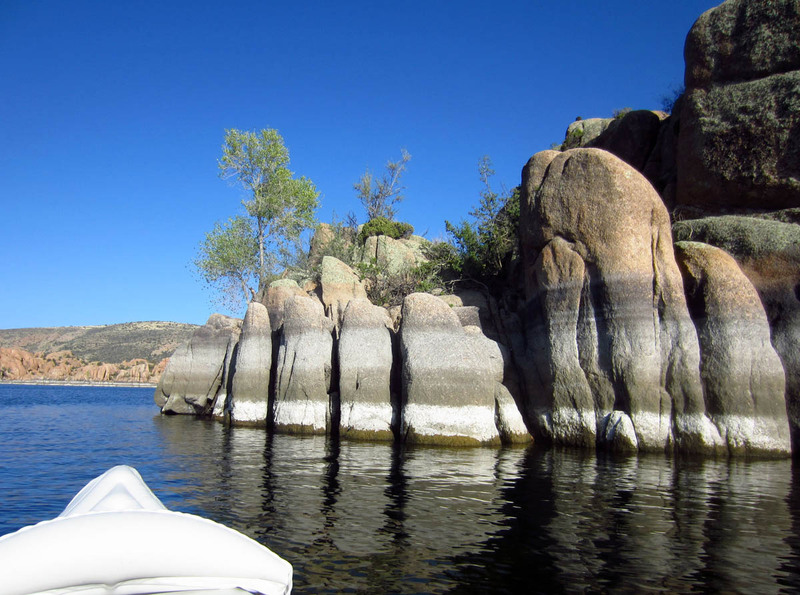 I wanted to go to Havasu, but I would need to find another plan. 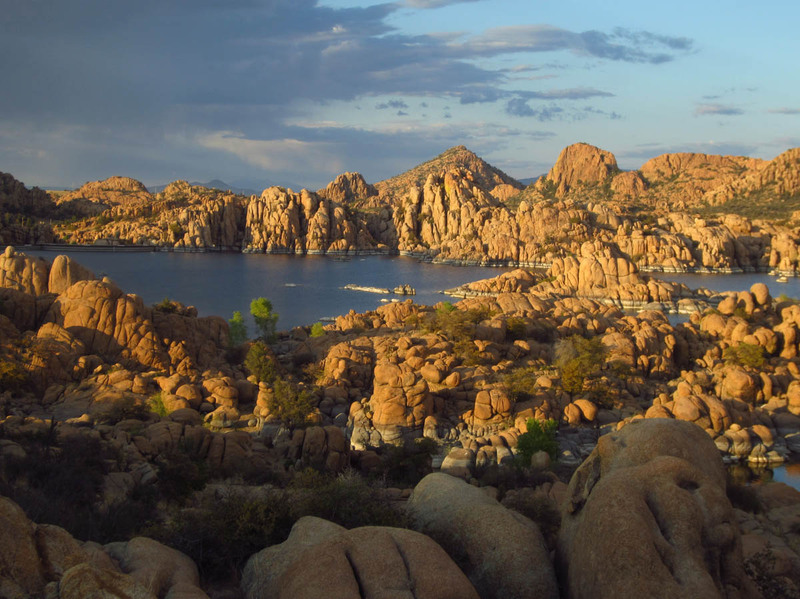 As I was perusing through my usual evening entertainment of blog reading, I came across a post from Hans and Lisa over on Metamorphosis Road about how much they were enjoying the cooler temps of Prescott, Arizona. 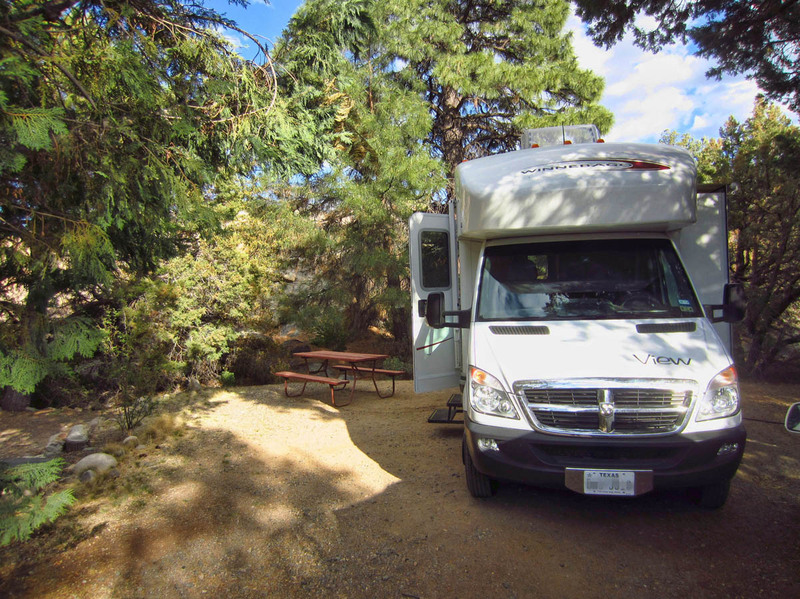 In addition, they also found an equally cool RV Park, the Point of Rocks. I was not able to get Lisa’s recommended site #66 or #67, as these were already reserved. I chose the next best site I could find, #61. The two sites to the right of me were empty all week, and to the left was a bank of thick evergreens. 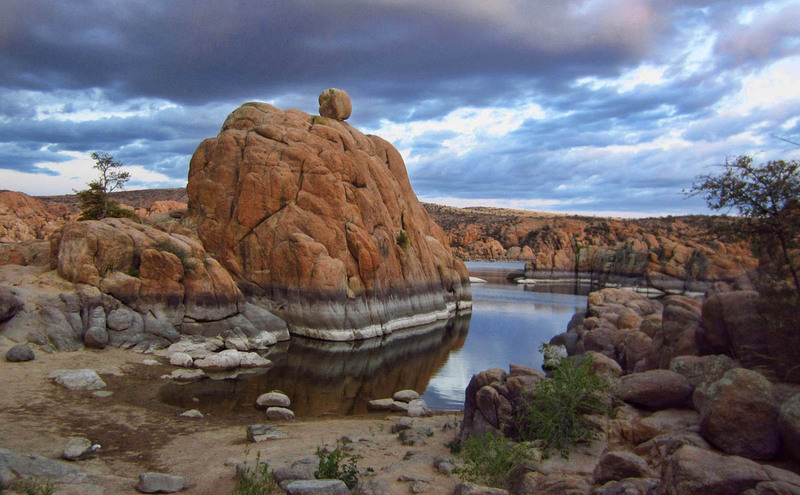 The back faced out onto the giant boulders that divided the park from gorgeous Watson Lake. Site #61, in the midst of the evergreen trees. The Winnie is right behind the giant pine tree. I wish I could describe the wonderful scent that was wafting from these evergreen trees. The Office Manager thought it might be the Ponderosa Pine. But there were also what appeared to be cedars and junipers all around. Whenever the wind would pick up, I could actually get a whiff of their fragrance through my back window. Heaven!! I haven’t worked outside since last fall, so it was a real treat to move my virtual office outside amidst these evergreens in what turned out to be absolutely perfect weather! 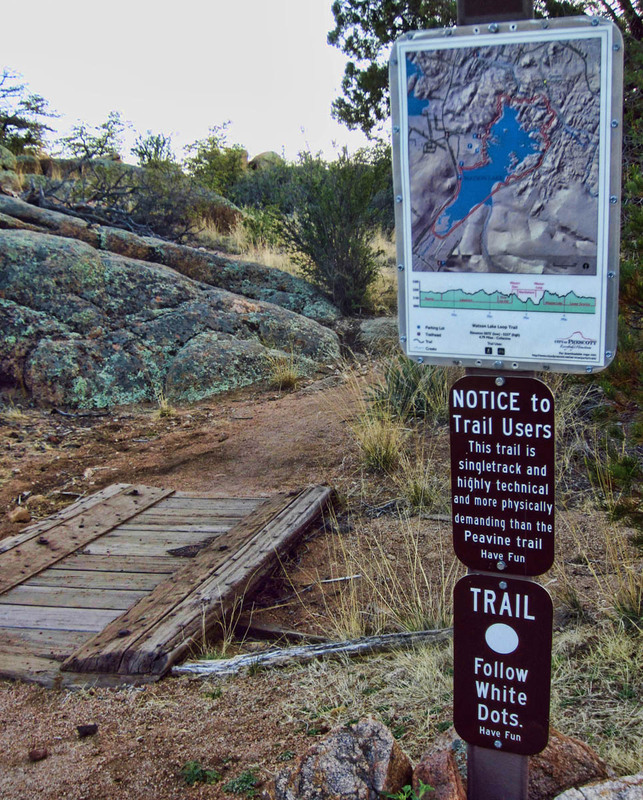 There was a junction trail leading out right from the campground that joined the Watson Lake Loop Trail, enabling hiking in numerous directions, right from the campground. 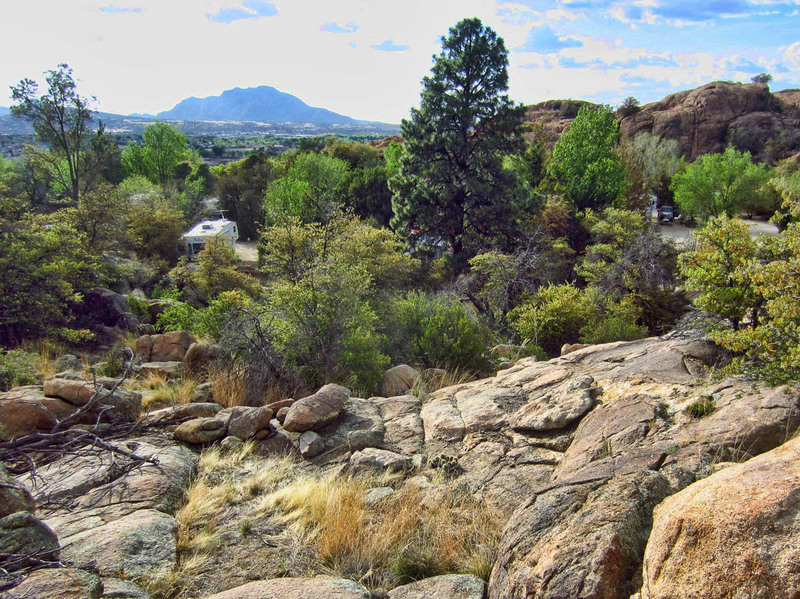 There was the boulder trail which lead off in many tangents up and over the Granite Dell rocks, or the more gentle sloping section of the trail which led around to the Riparian area, with loads of water fowl. 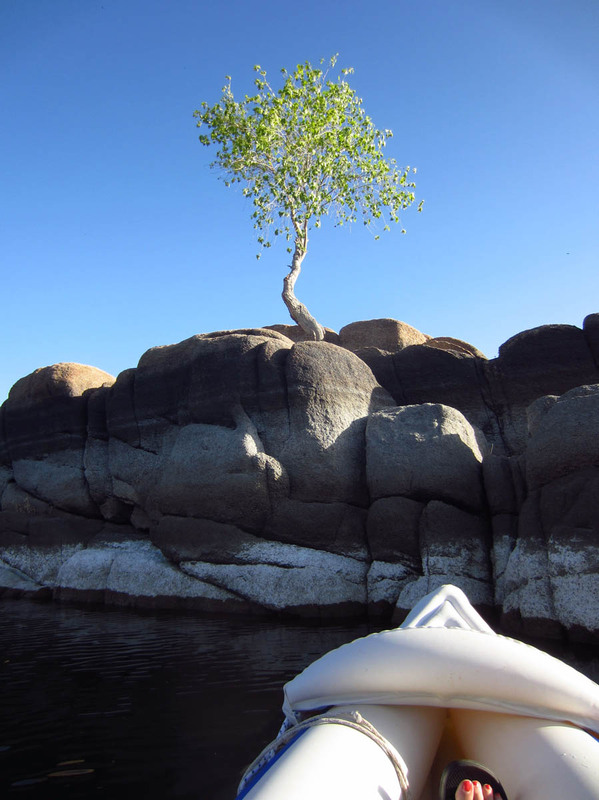 The minute I laid eyes on Watson Lake, I knew the Sea Eagle was coming out for its first voyage of the season. 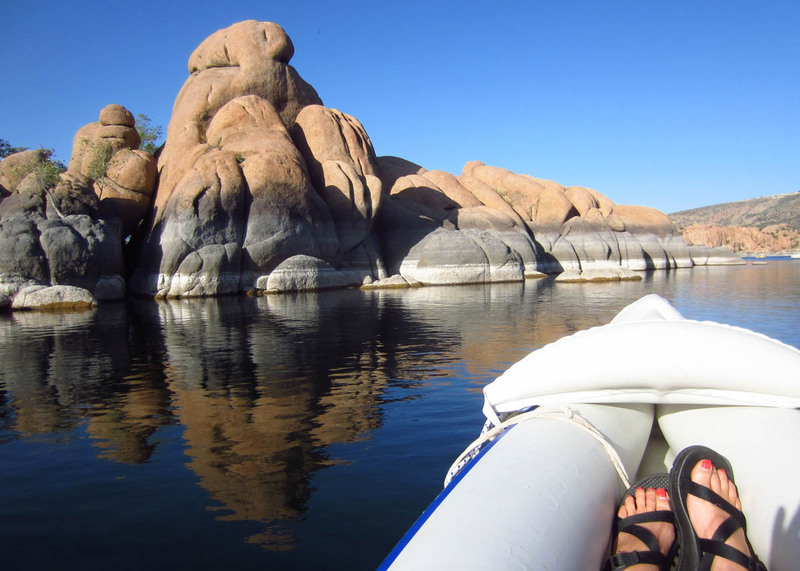 No way could I pass up paddling on that beautiful calm lake, as long as the weather held. The duckie on the rock is hoping for a handout! I checked the weather forecast, and it was mid 70’s all week, with only one day of wind predicted. Wednesday looked to be my best bet. 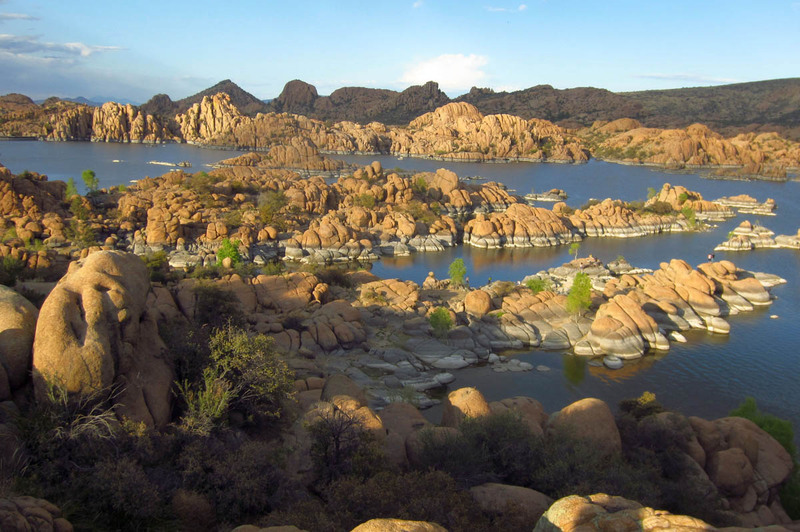 Wednesdays also happen to be the day that access into the Watson Lake Park is free, saving me a whopping two bucks! I was in! 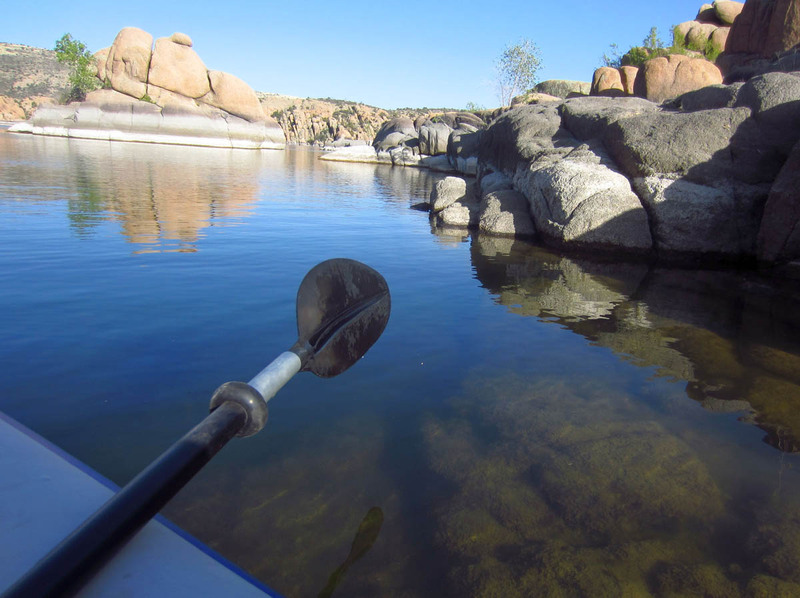 The water is clear and inviting..
There’s a great little boat ramp right in the park, which is perfect for launching kayaks. 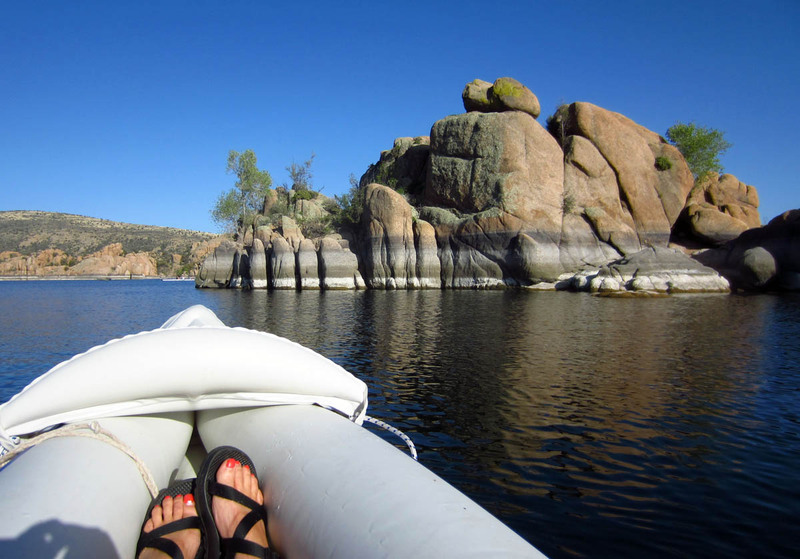 Watson is a “No Wake Lake” at all times, so we kayakers and rowers had it all to ourselves. 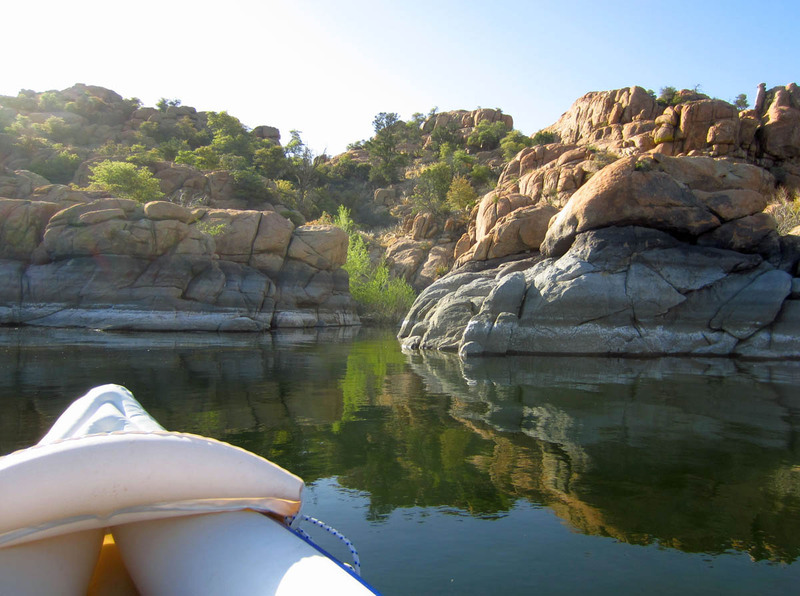 If only it were possible to package the stress relief, sense of freedom and adventure, relaxation and just downright fun that came from paddling among these gorgeous rock formations! 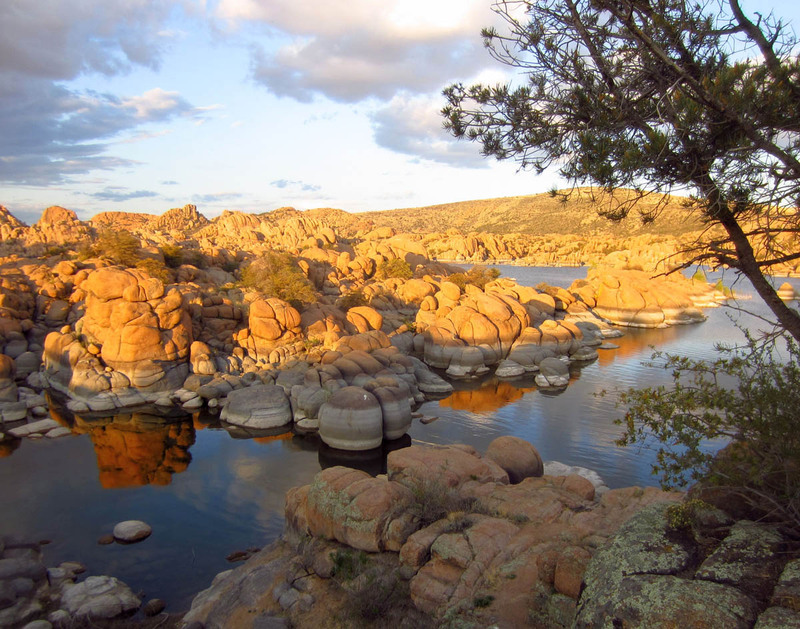 Point of Rocks in Prescott was just what I needed to slow down the pace after trying to outrun the escalating temperatures in the desert. It might not have gotten what I wanted, but I sure did get what I need! 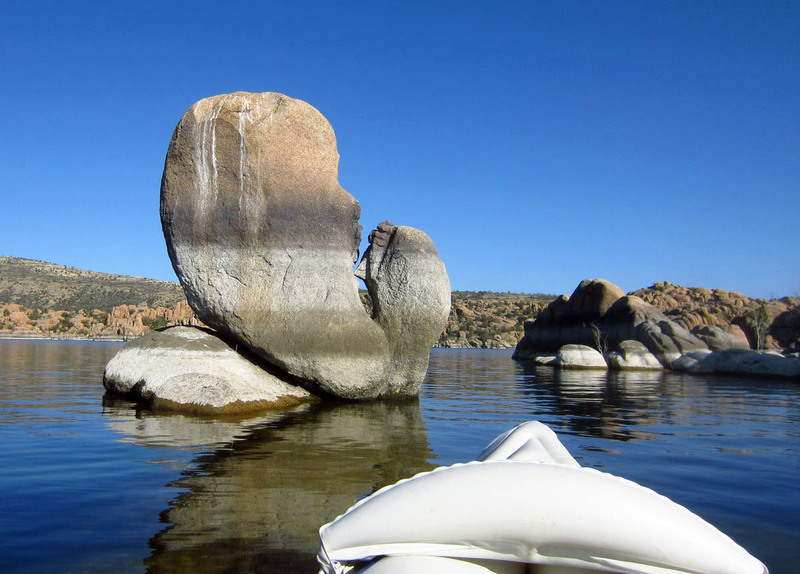 This entry was posted in Arizona and tagged Point of Rocks RV Park, Prescott, Watson Lake by Suzanne. Bookmark the permalink. 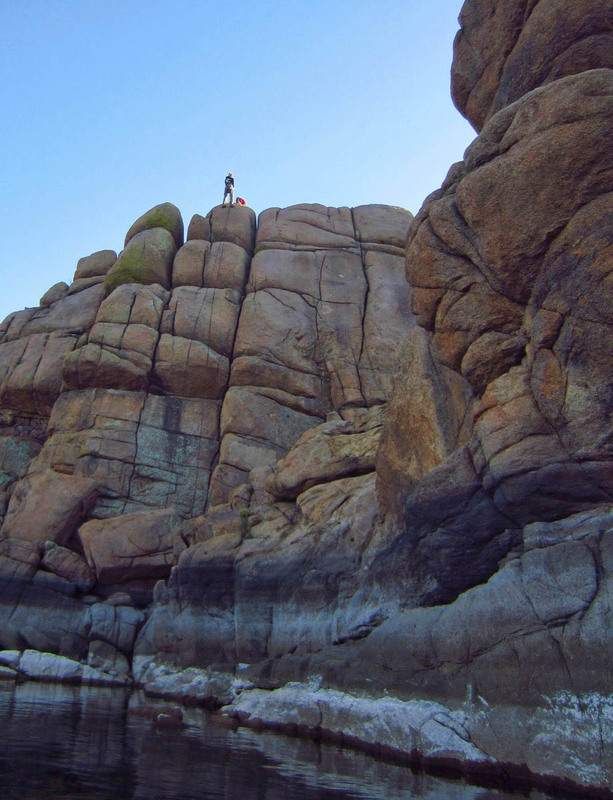 What a fantastic place and beautiful rock formations. That canoe looks a really useful piece of kit. Thanks, Dave! The little lake was so pretty, it almost looked fake, like a movie set! Yes, the little Sea Eagle only weighs 26lbs. 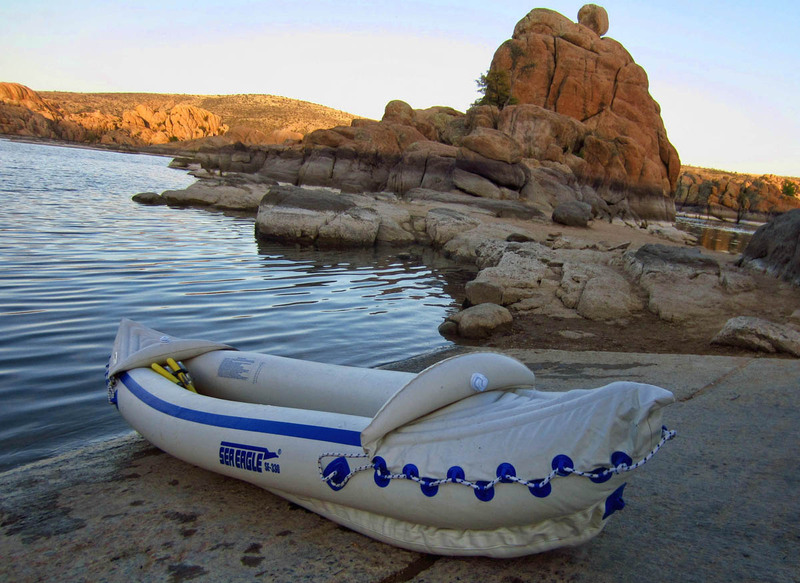 I sometimes wish it were a hard-sided kayak, but this one is perfect for travel, as it fits in the back seat of the Tracker. These are absolutely fantastic pictures. I am putting this spot on my list immediately. What a beautiful place. You sure did get what you needed and it looks amazingly wonderful. 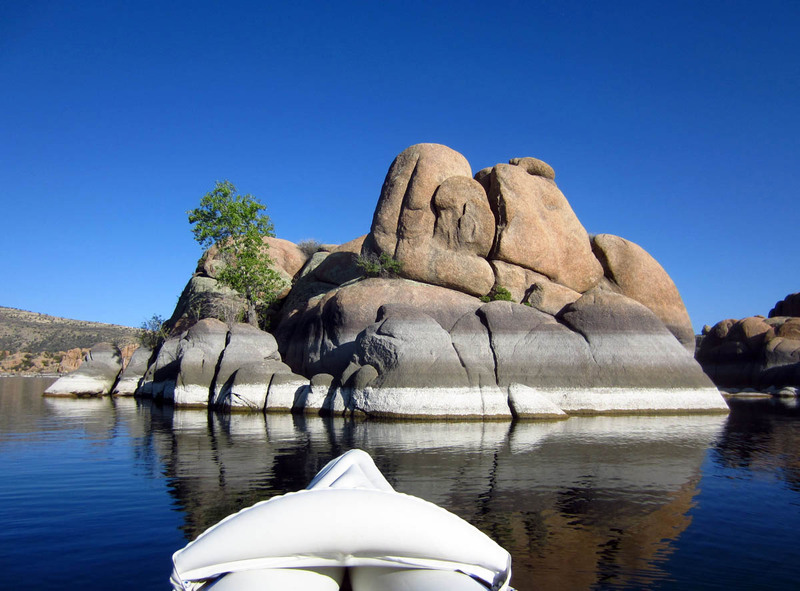 Wow, I never got to see Watson Lake from up above (only from the water, which I agree was magnificent!). 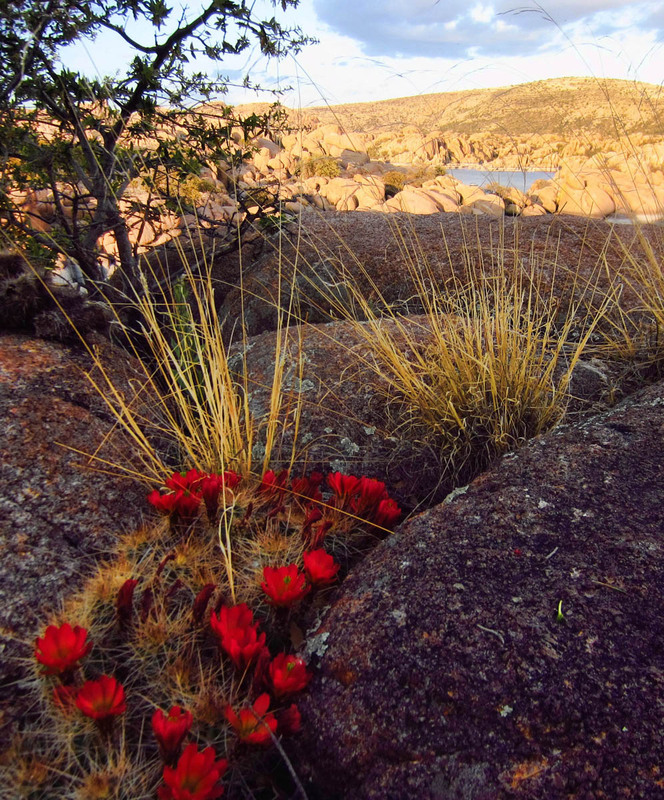 Now I think you’ve just convinced me that spending the big bucks at Point of Rocks is worth it! 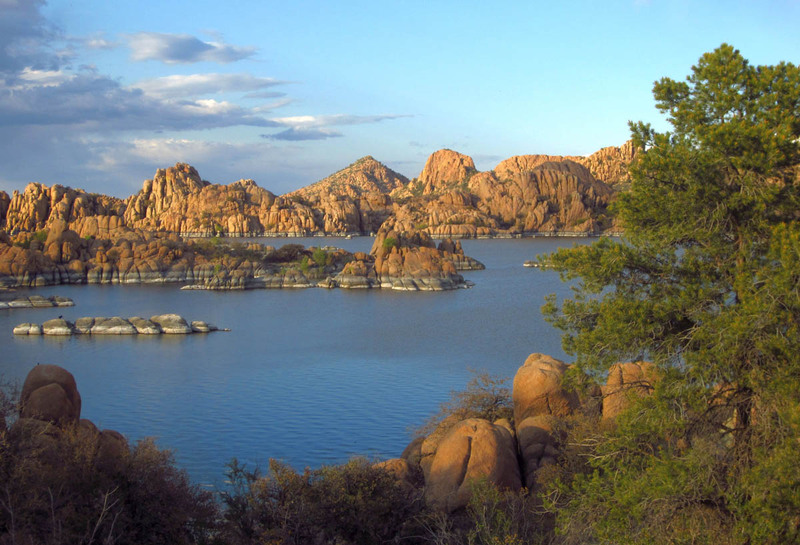 The pics are absolutely gorgeous…just love that little lake and easy-going town of Prescott! Ducks are always looking for a handout. If it smelled like vanilla, it was the Ponderosa pines. Gorgeous pics! You really have a talent for light and composition. Thank you, Nina! And thank you for visiting the blog. I am a big fan of wheelingit! 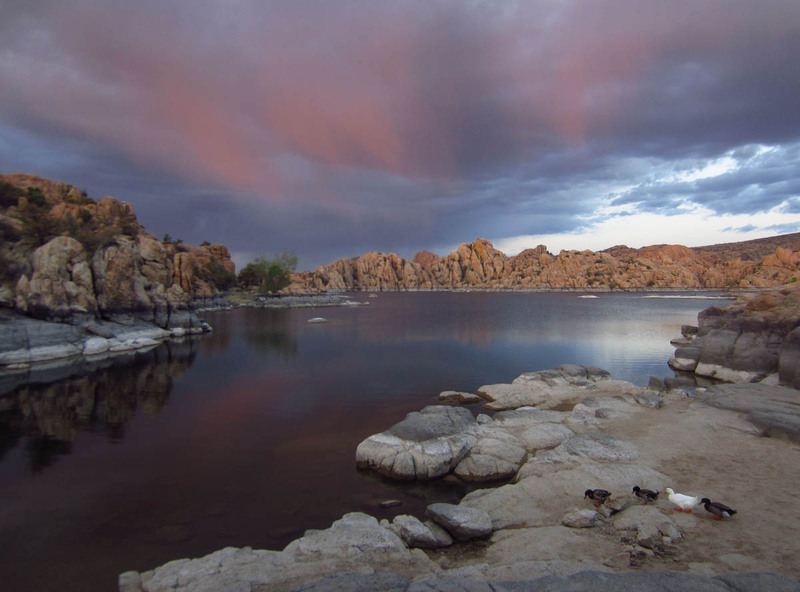 Watson Lake was one of those places that seemed to jump into the camera, all on its own. Pretty scenes here at Government Wash too, but too distant for my cheapo camera. It looks like a different place altogether depending on the time of day… Thanks again for the great directions! Stunning! 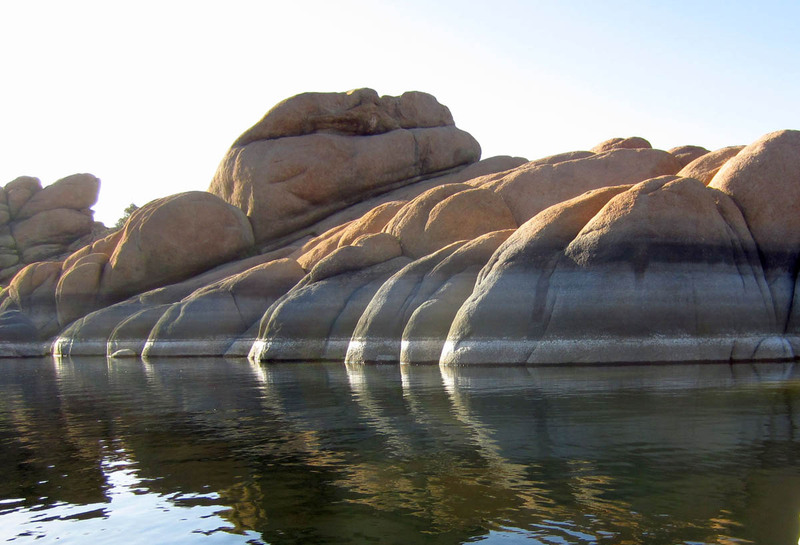 The only thing you missed out re Lake Havasu was seeing your friend. Your faired much better, trust me. LEE FRANC! I saw a woman that looked just like you yesterday, and I did a double take! I miss our heavenly NC spot. You and Bob enjoy the creekside sounds for me, please! I so wanted to kayak on Watson. 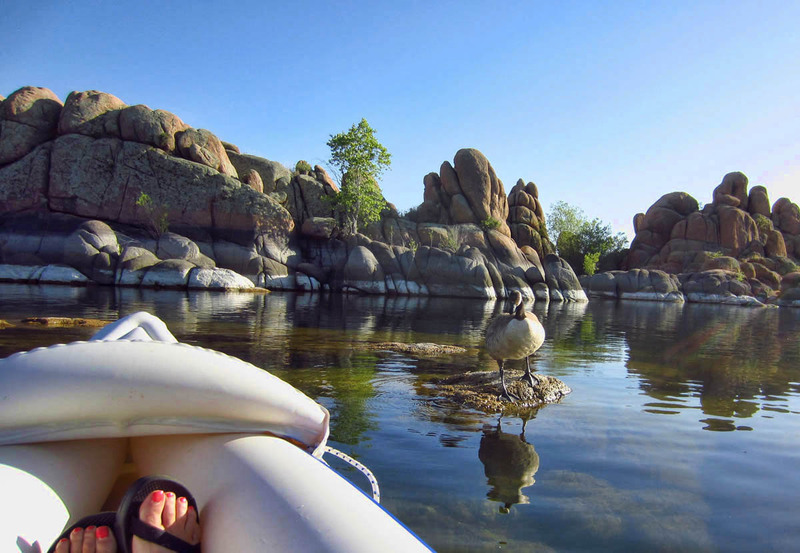 I love your ducks-eye-view of the rocks!